Former President Barack Obama travelled to South Africa this week to participate in the commemoration of the 100th anniversary of the birth of the late Nelson Mandela. July 2018 also marks the 75th anniversary of Arthur Ashe’s birth. 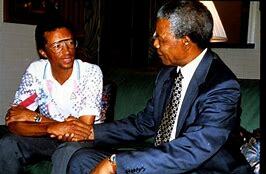 An ardent tennis fan, President Mandela was also a proud fan of Arthur Ashe and the two men held each other in high esteem. Ashe used his fame to draw attention to the plight of black South Africans. Meeting after Mandela’s release from prison, the two enjoyed a special relationship until Ashe’s untimely death in 1993.